Saw these on a vine hanging on to Amy’s mom’s fence. They’re Clematis, but I’m not sure which kind specifically, because there are hundreds of species and subspecies. 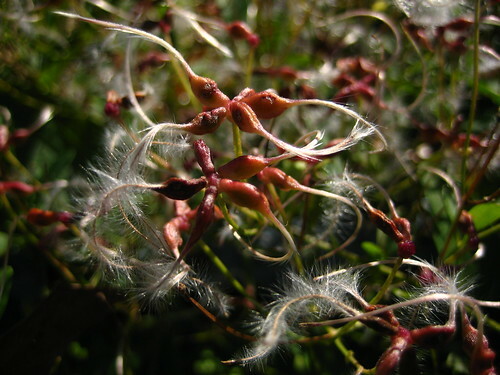 Based on the seed pods I was going to guess they were Clematis vitalba or Clematis tangutica, but Amy says these had tiny white flowers through the summer, so neither of my guesses would have applied. Any Clematis experts have an idea? More photos here. They look like some kind of alien organisms that takes people over and turns them into pod people.